Country music is more popular, widely defined, and controversial than ever. While the incredible success of the soundtrack to the movie O Brother Where Art Thou? has brought Bluegrass music and artists like Ralph Stanley into the mainstream, pop-flavored offerings from Nashville still top the charts. Subverting it all, bands from the Redneck Underground are making perhaps the greatest social statement in music since the punk movement, playing on redneck stereotypes even as they question them and giving attention to issues such as AIDS awareness. The third installment in the Country Music Annual series explores these topics and others, drawing together twelve essays that explore the musical genre from technical/stylistic, biographical, historical, and sociological perspectives. That may surprise some people, says James Akenson, coeditor of the series, especially those who think of country music as the dominant product put out by Nashville. "Even the dominant commercial product of Nashville can be studied from a wide number of perspectives which further deepens our insight," he said. "I like to keep in mind that country music is a commercial product." Even traditional "mountain" music is seeing some success, thanks in large part to the soundtrack of the Coen Brothers movie, O Brother where art Thou?. In the new Country Music Annual 2002, John Garst traces the roots of the most popular track of the movie (lip-synched by George Clooney), "Man of Constant Sorrow." But is the album at the forefront of a new movement in the national music scene, or a passing fad? "I think O Brother is terrific," Akenson said. "I suspect, however, that it is a limited phenomenon fueled by intellectuals who will tire of the Coen Brothers' inspired music and move on to something else. The core audience for contemporary country music will continue to consume the mainstream Nashville product." Far from the mainstream is the Red-neck Underground, a small but culturally significant musical movement centered about Little Five Points and the Star Bar in Atlanta. S. Renee Dechert and George H. Lewis's essay examines the function of subculture in American society and how bands of the Redneck Underground like the Drive-by Truckers react to the dominant culture with their music. "The Redneck Underground is an indicator species for long standing currents in white, southern working class culture," Akenson said. But don't expect to hear them on your radio anytime soon. "I doubt that any of the bands or individual artists have the ability or interest to be marketed in a mainstream manner." This third volume of the accalimed country music series explores topics ranging from the career of country music icon Conway Twitty to the recent phenomenal success of the bluegrass-flavored soundtrack to the film "O Brother, Where Art Thou?" 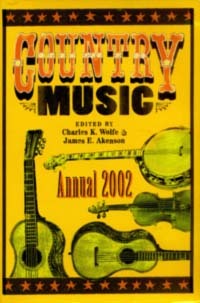 The differences between redneck subculture and the redneck underground, the promotion of early country music artists with picture postcards and a history of "the voice of the Blue Ridge Mountains" (North Carolina radio station WPAQ) are also discussed in these pages. Also included is an analysis of early marketing strategies for country music and a look at the formation of the Country Music Assocation as teh "chamber of commerce" for country music as hillbilly music was commercialized. Charles K. Wolfe, professor of English and folklore at Middle Tennessee State University, is the author of several books, including A Good-Natured Riot: The Birth of the Grand Ole Opry. James E. Akenson, professor of curriculum and instruction at Tennessee Technological University, is the founder of the International Country Music Conference.